Spring sun-dried harvest,one or two leafs/one bud,from Xi Gui village. 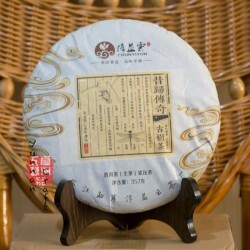 Although its named Gu Shu , we don't feel there is more old tea tree material than Qiao Mu in the cake.We like this tea for its very distinctive flavor and aroma. 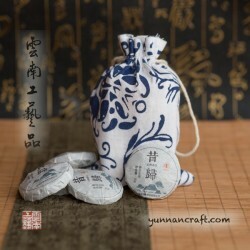 It has a very strong camphor scent and tea soup has very complex floral with sort of pine tree touch followed by intensive Hui Gan. This tea is naturally dried outside on the sun, so sometimes there are some other objects, like we found a grain of sweet corn. So if you are use to some factory clean standards , this tea is not for you. There are only few cakes available wrapped in hand written cover by the master. 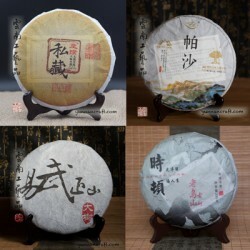 We cant claim that tea material comes from Gu Shu ( 300+ years old tree ) so we put in category Old tree.